We’re doing this walk with our son, Matt, his partner, Sim, and their dog who goes by the name of LD (or Little Dog if she stays still long enough for you to say it). They’ve all come up from Paraparaumu to join us for a couple of days. As Matt and LD, especially, are seasoned walkers, we know what we’re in for. But we park at the busy car park at he end of Table Flat Road, squeezing into the last two parking spots, then head off down the gentle farm track, with dogs all on leads, towards the river. For the first thirty minutes it’s an easy stroll along a broad and grassy track, and we can’t help thinking that we may get off a bit more lightly than we feared. Wiithin five minutes we reach the park boundary, and the dogs are let free. From there, the track continues downhill for another five minutes or so, until it reaches a high, arching bridge over the gorge, with the river some 30 metres below. After that it’s a steady climb for about ten minutes, during which we pass the junction with the Stoat Trap track to the river and Irongate Hut, to another junction where the Trig Track branches off to the right. At this point though, we’re only a couple of hundred metres from the Heritage Lodge, so just to say we’ve been there (and to replenish the water bottle that has leaked into my backpack) we go there first, and say Hi to a large group of deer-stalkers who are brewing up coffee before heading home. The sign at the start of the Trig track tells us that it’s a three hour trip to the summit. For the next hour and a half, though, it’s a lovely and never too demanding walk. The path is broad, and softened by a bed of beech mast, and well-graded all the way: long gently rising sections, interspersed with an occasional steeper slope. The forest, too, is beautiful. We walk between tall mountain beech, decorated with epiphytes (and one with a pair of possum collars, protecting a sprig of rare red mistletoe), and groups of brown-skirted soft fern trees (or katote). Stoat traps line the path: all empty save for the chicken egg, standing temptingly inside – maintained, so Matt tells us, by local volunteers in an effort to keep the stoat numbers under control. But then we get the first real change of pace. We dip down into a saddle, up onto a knoll. The path narrows, though for the moment it's still soft underfoot and at an easy gradient. We pass areas of wind-throw, which have felled the beech and left great walls of soil, showing how shallow-rooted the trees are. Then, after another half hour, we repeat the process, going down then up again, this time climbing more steeply onto a higher knoll. 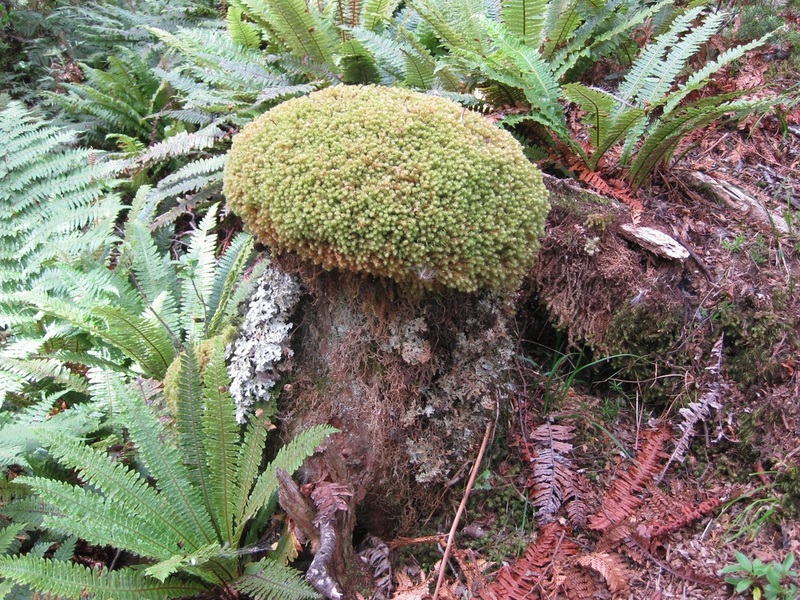 In places, now, lichen adorns the trees and moss makes cushions on the path and pillows on old tree stumps. Gradually, we realise, the going gets more difficult. It’s now short flat sections with longer, steeper climbs. Then, the gradient steepens further and the path narrows even more as it winds its way over tree roots and up rocky slopes. The beech get gnarly, more mossy and starts to thin out. We pause for a breather. According to the map it’s still another 2 km or so to the summit – probably an hour’s walking. It’s a hot day, and Matt, Sim and LD have to leave us soon. Shall we go all the way? No, let’s have lunch. We sit on a mossy bank, facing a clump of Olearia colensoi – a nasty shrub that tangles with everything around it, and further south is so dense that it blocks the track along the ridgeline. But we’re feeling satisfied, because we’ve climbed up some 500 metres to the bushline, and seen some lovely beech woodland on the way. And once we’ve negotiated that last, steep slope, it’ll be a pleasant hour and a half or so, back to the car, downhill most of the way. Life feels good. Status: off leash (under control), on-leash across farmland. Permit required - free from DoC office in Wellington.